If there's one way in which the prognosis for health care reform has improved since Scott Brown's victory, it's the fact Kent Conrad immediately accepted the possibility of using budget reconciliation to get changes through the Senate. Max Baucus is also expressing a firm commitment to passing the bill, and since he's the other Senate reconciliation gatekeeper, that gate is open. So before I move on: Thanks, guys. The rest of this post will be an attempt to figure out what the heck everybody else is doing. Seen in light of what Conrad and Baucus are up to, House progressives' refusal to just pass the Senate bill without changes makes more sense. The path to getting more of what they want just opened up, and they're not going to be pushed into a suboptimal option when a better one is available. Best of all, it's a path that requires only 50 votes, so a lot more conceivably could be achieved there than could previously have been done through conference committee or ping-pong. This all depends on getting 50 Senators together, but given that we actually managed to get 60 to do something at one point, even Scott Brown shouldn't make it non-doable. And anyway I think we would've had to get 60 to pass a conference report or ping some pong. I don't know if they have to play up the crazy behavior quite so much -- Grijalva's process suggestions have been bizarre, and I don't know how to estimate the probability that they'll do things that result in doom. But reflecting on the reconciliation situation convinces me that they haven't totally lost their minds, and may in fact be doing the right thing. I'm starting to think that a lot of the chaos we've seen out of the Senate is basically the opposite move. They've passed a bill that they're happy with, and they want the House to just pass it and move on without any reconciliation business. So they're being all, "Oh healthfreakout! We have to do jobs kthxbai" when really they could focus on health care just fine if they had to. I've talked about calling your Congressman before, but maybe I should've been telling you to contact your Senator, since they're more likely to be blocking the path to more progressive legislation here. So! Contact info is here on the top right part of the page. You could tell them to finish the job on health care, and maybe about how you'd love them to move towards your favorite thing -- public option? bigger subsidies? going national with Nelson's Nebraska Special? -- in budget reconciliation. You're a smart reader of this blog, so you can probably think of stuff you want to say. There's some players I still can't understand. Having Chris Dodd say that we should just take a month off didn't help. I mean, I think you might actually be able to do that, but only with a stable framework for how to do it when you get back. Then it's just like a recess, and we've had those. But Dodd's plan-free suggestion, coming from an ostensibly liberal chair of one of the key health care committees, was really odd. Dude, you're not even running for re-election! What are you freaking out about? And then there's Barney Frank, but at least he walked his crazy comments back and is now on the side of reason. I guess I can understand what people like Evan Bayh are doing, at least in the sense that it's consistent with their usual garbage. Anyway. But the player who really baffles me is Barack Obama. I understand that he's been letting Congress take the lead, and that usually makes sense. When Congress has a process for moving forward and things are basically in order, you should let them drive. But that's not the current situation! 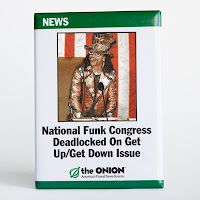 Congress is in chaos and there's a risk that competing factions will ultimatum themselves into an impasse and/or self-fulfilling obituaries will start being written. This is when the leader of the free world has to do some leading. He doesn't even have to do anything that would count as "focusing on health care reform" here, like talking about it a lot in the State of the Union. Just having him clearly ratify some process for getting a bill through and not make gruesome buzzsaw metaphors would sort out the confusion. One last thing: a lot of this has focused on taking people who look like they've lost their minds and making them out to be just using hardball public negotiating tactics. I think this is the right way to understand them, because I think hardball public negotiation is much more common among professional politicians than the sheer level of insanity they've been fronting. So how should we feel about this? Well, we don't have to like them any better for it. But I think it's a better state of affairs, just because it's less likely to mean that health care reform is dead. Still, this really needs to end soon and we need to converge on the Senate Bill + reconciliation vehicle plan. And that's where we need the one really powerful Democrat who isn't in the House or the Senate to step up and tell us how it's going to be. Barack Obama, where the hell are you? Update: Pelosi and Reid are, of course, charter members of Team Sane. Obama better be saving it up for the State of the Union. Because being MIA here is pretty inexcusable. Someone should remind Chris Dodd that they already took a month off. August, 2009. Well that saves me an angry call to Pelosi's office on Monday. First good news that I've heard all week. I went to a town hall today and I have to say that I am not optimistic. It mostly confirmed my worst fears about the House Democrats. Setting: Upscale neighborhood in Brooklyn. About 150 people attended. What happened: Weiner gave a brief presentation about the virtues of single payer, the evils of the Senate bill, the disfunctionality of the Senate and how Obama messed up by not taking the this to the people. Then Clarke spoke. She said that she agreed with everything that Weiner said and then told people that they needed to be more active to compete with the tea party crowd. Both of them indicate that they would vote against the Senate bill as is because "it is bad for New York". The main problem mentioned was that the bill would allegedly stick New York state with huge liability for new Medicaid costs. Weiner talked eloquently about single payer, Medicare buy-in and the evils of the insurance companies. He has no plan to get any of this passed the Senate. He also reinforced lots of Republican talking points about the Senate bill. He seems to be operating under the belief that somehow if the Senate bill is not enacted, we will get a do over on health care. Clarke spent most of their time passing blaming almost anyone else she could think of for the current mess (the Senate for passing a bad bill, the base for not showing up and letting the tea party crowd steal the show, the media for not reporting well, the Republicans for being mean, etc. etc.) Clarke and Weiner betrayed no sense whatsoever that they are now responsible if health care reform dies. Almost every word was about how other people have messed things up. When the moderator (a local assemblyman, I think) asked for a show of hands, a slight majority was against passing the Senate bill as is. However, in the question period, the pro-Senate bill people were much more vocal. At least four people asked the Representatives to pass the Senate bill with increasing levels of urgency and anger "President Obama could have a bill on his desk on Wednesday morning". The pro-Senate bill group also cheered much more loudly. 1. House Dems (or at least Clarke and Weiner) don't seem to understand that not doing anything is not an option. Neither of them said anything remotely close to "we will pass health care reform this year". 2. Weiner and Clarke were both really upset that the Medicaid provisions would supposedly destroy the New York state budget. Although Weiner ranted about how the Senate bill was a give away to insurance companies, the Medicaid issues seems like it might be the only one that isn't negotiable. 3. On the other hand, nobody said anything about the excise tax as far as I can remember. 4. These people (perhaps because they are from safe districts) seem have no idea what an electoral disaster it will be if the Dems don't pass any serious health care reform. 5. House Dems are so mad at the Senate that it is clouding their political judgment. 6. Weiner was surprised that someone mentioned budget reconciliation. He suggested that he might be OK with this but sounded a bit skeptical because (a) he thought that some Democratic Senators wouldn't go for it and (b) House centrists don't want to take another politically costly vote on a reconciliation bill that might or might not survive the Senate. 7. Neither Clarke nor Weiner in the course of more than an hour suggested a single realistic plan for health care reform. Any practical ideas ("just pass the Senate bill" or "use budget reconciliation to fix the Senate bill" came from the audience). There is no plan as far as I can tell. Frankly, it didn't even sound like Weiner or Clarke are even trying. 8. It is really, really important that all of the Democrats in the House hear from their constituents that they are to blame if nothing happens. Because right now, I don't think that these people get it. If you want comprehensive health care reform, call your Rep now! Where Do We Go Now, Sweet Child O' Mine? Pivot To Jobs? Sack Bernanke! Have You Driven A Ford Into A Wall Lately? Massachusetts People? Help Martha Coakley.